An overly confident Genie Bouchard agreed to a date with an opportunistic fan if the Patriots won the Super Bowl after falling behind. Well, the Patriots won. 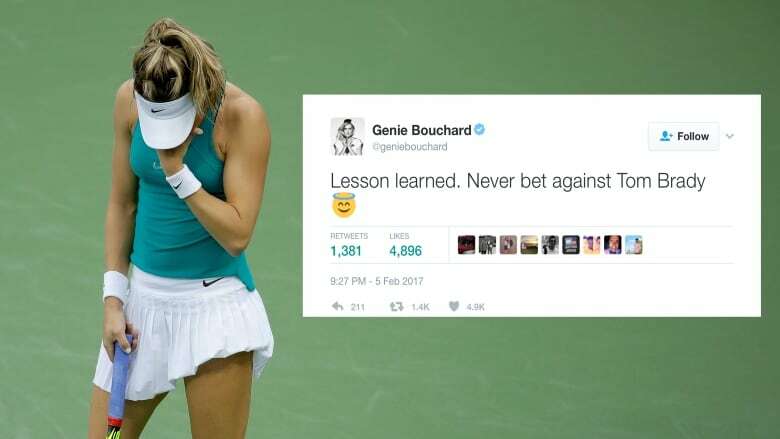 Canadian tennis star Genie Bouchard learned a lesson in counting her chickens before they hatch this Super Bowl Sunday. It all started when she was a bit too confident that the Atlanta Falcons would win the NFL title game after taking a big lead. An opportunistic and optimistic fan looked at the odds and decided to lay it on the table by asking the star for a date via Twitter. <a href="https://twitter.com/geniebouchard">@geniebouchard</a> if patriots win we go on a date? Perhaps feeling overconfident in the Falcons, or maybe some daze and confusion caused by Lady Gaga's whirlwind halftime show, but Bouchard replied with "Sure." And then we all know what happened next: the Patriots staged a huge comeback to win the Super Bowl. So is the date going to happen? Inquiring minds want to know! <a href="https://twitter.com/nickprice92">@nickprice92</a> <a href="https://twitter.com/geniebouchard">@geniebouchard</a> more important question is what's hers?